The Altoona Mirror Keystone Country Festival is now held at the Blair Country Convention Center. Bring your family to one of Blair County's favorite PA Festivals. This annual event is held every year the first weekend after Labor Day. Most people recognize the Keystone Country Festival as being held at Lakemont Park . Now Blair County has two great PA Festivals , both festivals are held the same weekend. Lakemont Parks new annual festival is called "Altoona First Festival". Each festival offers unique homemade PA crafts, ethnic foods, and entertainment. The beautiful Blair Country Convention Center offers both inside and outside Craft Booths, an Antique Car Show, Farmers Market, and Live Entertainment. It's a beautiful PA Craft Show that keeps building year after year. Offers Artistic Interaction-Live Entertainment-PA Lottery & Sports Pub! Children and Adults alike will enjoy the interaction of artistic events. A PA Festival for the entire family. FREE Scrapbooking Classes and Cropping. Enjoy three days of Non Stop Live Entertainment! Who isn't entertained when you see an Antique Car Show? You can even play your favorite numbers or buy your PA Lottery tickets at the PA Lottery Booth! You'll be pleased to know you won't have to miss your favorite sports while attending the Keystone Country Festival. There will be two large screens with that weekends best sporting events! You can relax and take a break from all the festivities, munch on your favorite snacks and order a few drinks while watching racing, football, or any sports event that happens to be on TV at that time. 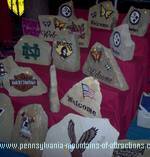 It's a great time to pick up many of your favorite holiday handmade Pa Crafts. Spruce up your home or do some Christmas shopping. You can always find something unique and personal to give for a gift. Why not make a weekend out of visiting Blair County and attend both PA Festivals? The cost is very little, only a few dollars for each admission, and only a few miles away from each other. Spend your weekend roaming from one PA Craft Show to another and see what makes PA Festivals the biggest PA Tourist Attraction.